More than ever, healthcare institutions are required to distribute medical data to a multitude of recipients, such as patients, legal representatives, research facilities, and other healthcare institutions. 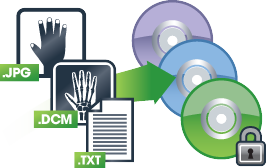 Medical professionals often must use a range of delivery methods, from printed paper and PDF to DISCs, VPN, and cloud-based solutions. The need to train, support, and utilize multiple products to meet these data distribution requirements can pose a time-consuming and costly challenge to healthcare institutions. The answer to these challenges is Vertex. Vertex provides an affordable, single application that enables medical professionals to share data from a variety of sources to nearly any custom-configured destination using industry-standard and proprietary means. Vertex simplifies and facilitates the sharing of data, regardless of the receiver or delivery method.